Sew Serendipity: All Spiffed Up for Market! All Spiffed Up for Market! Well, I have been busy sewing for myself (for a CHANGE) and it has been so fun! I made two new bags to take on our trip to market. One is a purse and the other a travel bag for reading, snacks, and probably a small knitting project for the plane, plus whatever else last minute stuff I decide I think I can't live without. 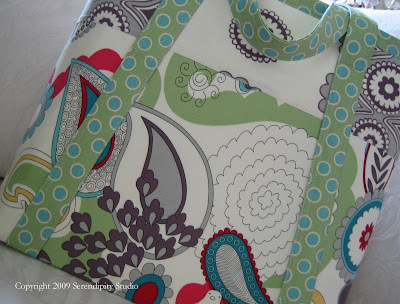 The first one I am going to show is from the Sara Satchel pattern. I decided to use the one-sided Peltex fusible in it instead of the buckram/fusible fleece combo and it worked great. 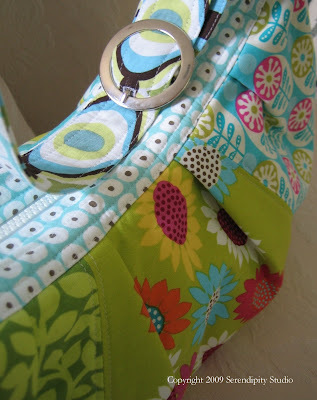 I highly recommend this substitution if you are thinking about making this bag. Notice also that I decided not to crease the sides for a different look. The next bag is from my new pattern, the Sylvia Sling. I used a mish-mash of fabrics on it this time in the three piece variation for the side. 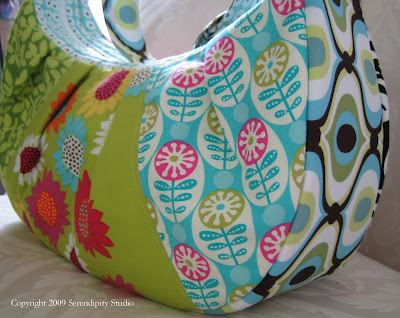 I am really liking the different fabrics together and how each side has its own personality. Note that this bag is loaded with my junk and still manages to look great! I plan on getting another Olivia tunic length dress made to wear at market plus some skirts.....so nice to carve out some fun sewing time! 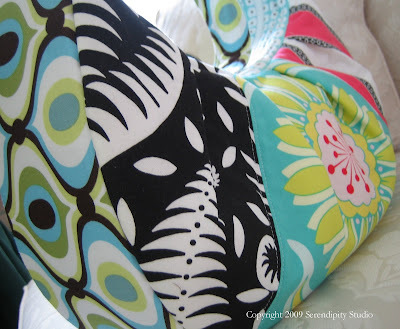 Let me know what you think about these sewing adventures!! Hope you have time to get some sewing in this weekend, and Happy Mother's Day to all of you hard working moms out there! !